So I am sitting here writing a paper for one of my classes, listening to music (like I always do, because I love music) and I just got a really innovative idea for a potential music project in my school! I'm currently listening to the album "Playing for Change" where songs were created from recording separate, individual, musical tracks with either one voice and/or one instrument from around the world, in order to produce a complete song. This movement eventually turned into producing entire albums that have truly innovated the music industry. So I thought, we should be doing this project with our students! So, I am taking the initiative (along with the music department at my middle school) to get this project rolling. We would first test this project in a small scale, by individually recording our students singing and playing their musical instruments into GarageBand. Then we would have our students edit their individual music tracks and splice them together to make an entire song composed from all of the separately recorded tracks. Much like the music industry does today. That would be cool! But even cooler, would be for my school to reach out to other schools across America, and around the world via social networking to see if we could pull off the same type of "Playing for Change" project. What if ... we were able to collaborate with students from different cities, countries, and continents in order to produce a song created from separate recordings from around the world? Better yet, what if we were able to produce an entire album? So, here's how it works. Each participating school would record their students singing and/or playing musical instruments (native to their geographical region) to create a single music track. Then, each participating school would digitally share those tracks via the Internet to all other participating schools. Finally, each school would have the opportunity to create an authentic song using GarageBand from all of the musical tracks that were recorded and shared from the participating schools around the world. By simply reaching out on Twitter, and sharing this blog post, I think we could get a lot of people involved on this. We might even be able to create some Google Hangouts with other participating schools to discuss the process and decide on a meaningful song using a specific tempo and key. Call me crazy, but I really think our school can pull this off, and it would be such an amazing project. Not only would this process teach our students about cultural awareness, citizenship, and world music, but it would also teach them about global collaboration and technology integration from splicing all the individual music tracks together to produce a song in GarageBand. 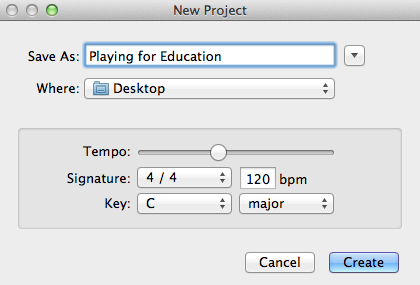 Therefore, I call this project, Playing For Education. If you are interested in participating in this idea, or think you may know someone who might be interested, please share this blog post with them and have them reach out to me @MrLands.